May the passers-by be charmed by your lady dog’s style in our luxury pink leather dog collar! Handmade of selected dog-friendly full grain leather, a hot pink dog collar ensures comfort walking and a prolonged wear. It is a perfect dog supply for walking, training, visiting crowded places, a vet, dog shows. Old bronze-like squares and stars have a wonderful look on genuine wide leather strap, they are secured with strong inner rivets that prevents their falling out. Attach a dog leash to welded D-ring and enjoy walking with your pet. A strong rustproof traditional buckle will serve you for ages. The edges of a pink leather collar for dogs are rounded and waxed, so you may not worry about your doggy’s skin irritation or rubbing. We pack our pretty pink leather dog collar FDT Artisan in a brand box with a seal on it. Brighten up your girlie’s life with our beautiful pink leather collar for dogs from the producer directly and get a free ID-tag! 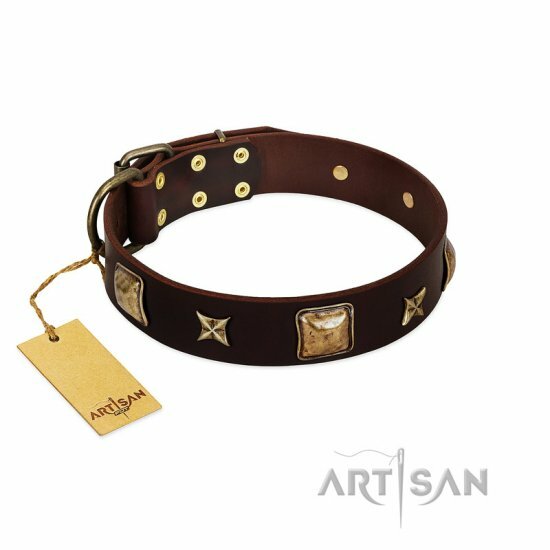 Chic design with squares and brass stars add individuality to your dog. Are you looking for an extraordinary leather dog collar for your dog? 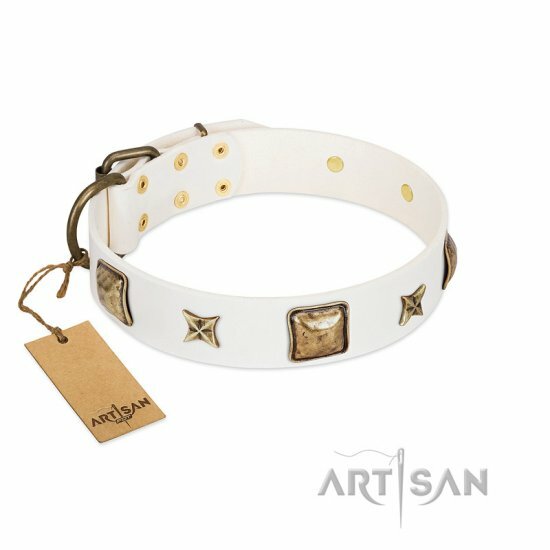 This white leather dog collar is handmade with love and care for your dog.